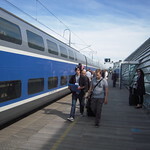 Avignon TGV (IATA: XZN) is a railway station located in Avignon, Vaucluse, south-eastern France. The station was opened in 2001 and is located on the LGV Méditerranée high-speed line and Avignon-Centre–Avignon TGV railway. The train services are operated by SNCF. The station is located 6km south of the city centre.